A great day today, as we forged through the platforms in full gear. The day started with a downpour, as we sat in the mess coach debating recent board events over tea. From time to time we stuck an arm out of the window, and - you need to be lucky in war - the rain stopped just as we were getting up to move out. Here is the gang, arriving in force at Broadway with 3 vehicles. We spread ourselves into a number of smaller gangs, so that we could progress the work at different levels. In the foreground a first length of 24 sleepers has been laid and is waiting for the pair of rails on the left to be lifted in. On the left a sub-gang is clipping up the length laid in last week. As the clipping up was going on near the platform end, another gang had been busy laying down sleepers in the loop, and this made it possible for yet another sub-gang to start dropping in more rail. Laying the sleepers progressed at a pleasing pace, but sometimes we had to stop and dig out ballast from underneath them, as they ended up high on small ridges. Steve levelled all this carefully, but these ridges had a habit of reappearing, due to vehicular traffic up and down. The nips were just right for this job. The sleeper layers absolutely zoomed along in the loop, but had to pause from time to time to let the JCB through with more rail. At lunch time the loop road had passed underneath the footbridge and was near the northern end of the station building, with the rail laying team not far behind. The orange coloured rail lying in the six foot is the new rail destined for the platform road. You have to position this in advance. John was in charge of fairy cakes today. He cast a critical eye over them, and over the amount of money in the honesty box in the foreground. Did you pay? How many fairy cakes is that you've had? One o'clock, and a change of shift. The PWay gang march off back to work, as the station gang head for the tea urn. The new rail in the through road is ex steel mill and therefore undrilled. Leigh here sets to work preparing the newly rail to receive its fishplates. Meanwhile on the loop road Steve and Nigel were lifting in the next length of S/H bullhead rail, now just about under the footbridge. Further along the loop road the sleeper laying gang, delayed by a few last fairy cakes, found that Alan had not wasted any time waiting, and begun to stack up high the chaired up sleepers he was fetching. Behind us, the lovely evening sun began to light up the railing team under the footbridge, domiated by the venerable GWR Scots pines so typical of the site. Now past the station building and approaching the signal box, the sleeper laying team on the loop road had to pause to let Steve through with the next pair of rails. It's busy here. As the light of the setting sun hits the newly revealed station building, another photographer seizes his chance. The dappled sunlight hits the trusses and arched ridge purlins on the canopy. The end wall, disguising the last room (a kitchen on the drawings) is now clearer after the temporary 1970s BR location cupboard was removed. Several others still remain on site. Will they also be removed? The evening sunlight is too tempting to continue with the smaller pictures, so here is another big one in all its golden glory. More rail is dragged through by Steve, this time SH bullhead. The sleeper laying team is right in front of the signal box now, having laid out one of the two roads almost through the station site. Here they are in front of the box, with a majestic row of pines along the rear. The through road is way behind now. Although the intention was to move the roads along in tandem, in practice the presence of the JCB (as here) hindered the Telehandler in bringing more sleepers to platform 1, so we concentrated on the loop instead, bringing it out far ahead at the end of the day. The three sleeper layers were on full time duty pulling the heavy chaired Jarrah sleepers off the Telehandler forks, so a small team followed on behind to straighten out the somewhat irregular result. A few moments later Steve was ready to lift in the two SH rails he had just brought in. Our total laid today was a respectable 8 panels, or 16 rails laid in. We were very happy with that. The last two S/H rails had half a fishplate on them still. An extended go with the 'animal' failed to dislodge the bolts. Ah, so that's why they were still on. Steve was undeterred, and just cut them off with the disk cutter. No problem. This picture shows the maximum extent of the sleepers laid today, now well past the signal box. Exact numbers laid were unknown, perhaps 200? The extension train has been cleared of sleepers in any case, and it will shortly be taken away again for reloading with concrete sleepers. These are required to open the 'second front' at Childswickham on Wednesday, when the other gang will resume laying north. We want to get all the track in by the end of the year. The Telehandler here is just making a 180 degree turn, in order to go back into its stable at Winchcombe at the end of the day. Its driver has just taken on the responsibility for the Broadway station fit out, and we fully expect that in future our Hi Viz safety gear will sport a compulsory tartan design, instead of just plain orange. We must move along with the times. While the sleeper laying team has called a halt to the day - we are all over 65, some of us over 70 - the rail laying team cracked on with a last pair, now at the level of the middle of the station building. A last view from the other end. It's starting to get dark now. The loop road seems to stretch right through the station, but it needs three more pairs of rails to catch up with the end of the sleepers laid. Here is the end reached today, seen from under the canopy. The sleepers laid out (which is only the first stage of track laying of course) have almost reached the southern end of platform 2. The rail head can be seen in the R/H foreground, and is now mid-building. The through road however gained only 2 panels today, due to the conflicting movements of the JCB and Telehandler. A last look a the end of the day, with the light now going quite orange. On Monday we will continue with ballasting by the goods shed, and the remaining bund near the old signal box will be removed and dropped behind platform 1 at the southern end of the building. News on the Broadway station cafe. The cafe, for which the station building was laid out with dining room and kitchen, has just been dropped from the plans in a surprise move. Instead, the space will become a souvenir shop, with a coffee machine. 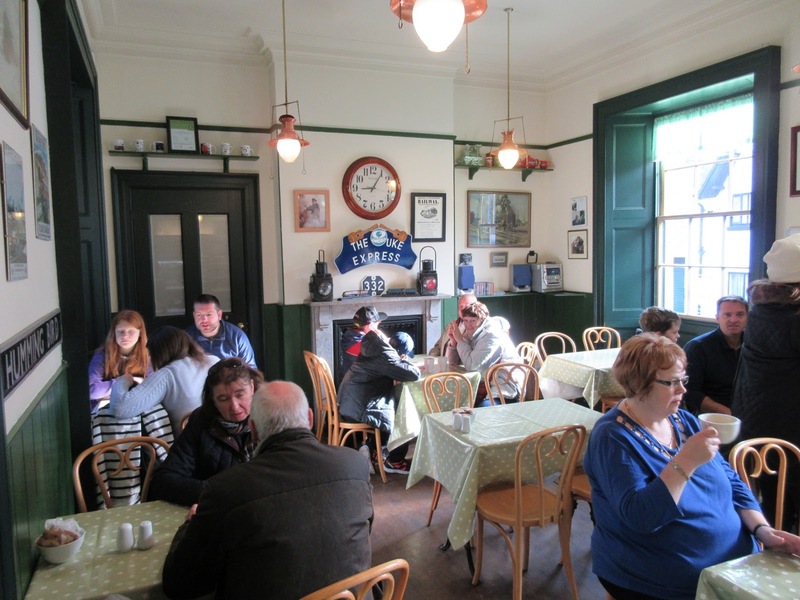 This picture of a similar cafe at NYMR Pickering station shows what it was intended to look like, a very close resemblance. Fireplace, wainscotting, Victorian wall and ceiling lights. The wall space will be now be fitted with shelving, and the kitchen will become a store room. Concerns about staffing the intended cafe have led to this last minute change of plan, we were able to ascertain. Great to see such progress, Jo! Am I right in thinking that the southern turnout should be more straight-forward to do than the double northern one? I'm assuming that you will be able to re-use all the timbers from Laverton without special long ones? Anyway, let's hope the reasonable weather continues for a few more weeks! Good progress today and thank you for the well written update. Well done the GWSR PWay Squad. Fantastic pictures. It is really starting to look like a perfect film set of a 30s country station, I can see Hercule Poirot, Miss Marple and Father Brown alighting soon but not necessarily in that order! Indeed, thank you once again for an excellent blog and beautiful images showing not just the tracklaying but the whole station area. As a shareholder in this exciting and worthwhile project I profoundly disagree with the plan to replace a traditional café' and kitchen with a souvenir shop and a COFFEE MACHINE! If there are any other readers of this brilliant blog who share this view I would be most grateful if you could contact me on my email- pensarnroses@gmail.com. Thanks in anticipation of your support. Why haven't the local WI, Towns women Guild etc been approached to help with staffing? It's a missed opportunity. I imagine nobody thought of that option, Sandra, perhaps the decision makers were all men !! No need to bring sexism into the argument Mr Smith. If you have evidence to prove your theory, give it, if not wind your neck in. Maybe you're the one that should be winding his neck in? It was a light-hearted remark, no doubt posted with tongue in cheek. With the current nonsense about so-called harassment in Parliament we don't need anyone tainting this blog with political correctness! Stick to news about the railway. Anyhow, using the WI, etc. was a good suggestion. Cannot believe this decision, very retrograde. When customers get off the train they will be met by a machine ! What are they going to do while waiting for the next train, Broadway village is some distance away I understand especially for older folk. Why has the change in plan re the café not been announced in the proper manner via the boardroom blog? If it is considered impractical to staff a café, how is it then that a souvenir shop can be staffed? I can understand the concerns about finding enough people to staff the cafe at Broadway. Volunteers are stretched pretty thinly already, and putting together a new team to run Broadway - not just on the catering side, but in all roles - is going to be a big ask. But surely the simple solution would be to just franchise the cafe out, like the Flag & Whistle at Toddington. This has been operated by outside contractors for years, and it's been a great success. My first thought would be to approach the various cafes and tea rooms around Broadway (there are quite a few of them) and see if any of the owners fancy opening a branch in the station. That would have the extra advantage of creating a genuine link with the local community. If nobody local was interested, I'd look around more widely. I'm sure somebody would welcome the chance to run a cafe in such a potentially lucrative location. There's good business just waiting to be done, both for the cafe operators and the GWR itself, while providing a facility that I think people are quite reasonably going to expect. If people arrive at the beautifully rebuilt Broadway station and find there's nothing but a coffee machine waiting for them, frankly it's going to be an embarrassment. It'll make the railway look rather cheap. All show, no substance. I'm also rather concerned that if Broadway does end up with a coffee machine, it'll be the same type as used at CRC. That contraption produces horrible coffee! Still, I suppose ditching the catering facilities does bring one advantage. If the kitchen area will now be used for storage, we won't need those ugly, intrusive containers that have been plonked down at the north end of Platform 1, completely wrecking the period appearance of the station from the Honeybourne end. Personally, I'll be glad to see the back of them. So it's not all bad. The containers *will* be removed, won't they....? I agree with previous comments regarding the loss of the cafe. It would be far better to have proper refreshments than a coffee machine. Passengers would be more likely to to stay at the station and enjoy a break. It is a long walk into the town if you want more than a coffee. A retrograde step in my opinion. I hope this is not an early April 1st jape because I heartily agree with the comments above about the refreshments room! It MUST be a cafeteria, (to give it its untrunkated name). As already mentioned, what a missed opertunity to sell meals and snacks to the passengers and also the photographers and other casual callers. Maybe it could be run on a 7 days a week basis as a business. I'm sure that someone would take it on, (with all the health and hygene course documents of course), as such a business. Otherwise it will appear to take the icing off the cake, so to speak. This decision must be reversed! That said, I must wholeheartedly congratulate the P Way team(s) on their progress today. A lot of track laid today! Excellent pictures as well. What is it like having lunch in the four foot? At least you have plenty of CHAIRS to choose from, that is the KEY factor, even if you don't have a TABLE! (Have to see the loco dept. about that!) LOL. Regards, Paul. A day of tracklaying celebration spoilt by the short-sighted moronic café decision. Almost as stupid as the open sided carriage shed planned on the NYMR. Why do such decisions get made. Ist World War Generals come to mind. As a very regular visitor to the NYMR for many years, I can assure you that, despite the sterling efforts of the staff, the Pickering Station buffet is pitifully inadequate at busy times. The queue exits the door making it impossible to see whether or not there is seating space inside. Local cafes, pubs and restaurants are within a few 100 yards; very different from Broadway. Almost all successful catering outlets on heritage railways are franchises. You are selling a relatively expensive heritage experience which depends on return custom. Please reconsider this ill-judged decision. A coffee machine?! So what could have been (and probably, after yet another battle still will be) a very attractive "Brief Encounter" style Refreshment Room, they would replace with Some cruddy Vend-o-mat? That cafe would be the beating heart of the new station. Somebody "up there" seems desperate to somehow tackify the railway by any means possible, and they're still not admitting defeat, yet. All the luck in the world for this next battle, guys. Another option may be to ask the B&B people next door. The hours could be compatible with their business and they are local! The Pickering tearoom uses mostly paid staff employed by the railway. As the GWSR becomes a big railway it must wake up to the fact that you can't do everything with volunteers and there is no shame in employing people to further the business. The decision not to open the facility as a cafe, goes hand in glove with some of the other daft decisions made during this project. However please can someone inform the readers, what efforts have been made to staff the cafe so far ? You guys have done a brilliant job, and the pictures bring it all to life, thanks. Input on the catering, I have been a volunteer on the catering side for a year now, so a newby compared to a lot of people, what I have seen , during this year is that we have enough volunteer's to man the Café at Winchcombe, Train 1 with the bacon butty special, Train 2, with the smaller catering facility and next year we will require to man Train 3, again with a smaller catering facility and during each month we are asked if we can fill in last minute vacancies, so with Broadway in mind I can personally see that manning a new Café,as a volunteer, would give our manning staff headaches. This is just my observation and no way speaks for the On Train catering committee. Bye the way working the catering trains and café is great fun. I think there should be a cafe and not a shop. I don't see the point in having another shop at Broadway, the sales will just be split between Toddington and Broadway and I don't think much extra income will be generated. The majority of visitors park or visit Toddington and they know the shop is there. It will be really disappointing not have a cafe. I understand that staffing may be an issue but I have not seen any requests or calls for volunteers that might be interested in staffing the new cafe. There is probably at least 8-9 months before a cafe could be ready so this seems like enough time to recruit more volunteers. As a regular blog follow we but rare commenter I want to say thanks for the continuing brilliant commentary of the progress. It is more compelling than many books. The progress has been equally brilliant. This applies equally to the station group also. I wish I lived nearer to lend a hand. I would need to be given my late father's PW skills (I have none) though. Regarding the cafe decision and putting a sort of sleuth type thought to this. So the building is planned and built by volunteers with a café integral to the plan, at the last moment it becomes a shop, the decision seems to have "leaked" out via the extension blog as opposed to,say an announcement on the board blog. So it's difficult not to conclude there is some external politics here as the franchise option has not been offered as an alternative to staffing with volunteers. Such as: Have local traders put pressure on not to nick there trade? Has the local council done similar? It all has the feel of issues lurking in the background. No doubt all will be revealed in the fullness of time. Your latter point is exactly what I've been wondering myself, it would certainly account for the somewhat strange decision. I can totally understand why it's unfeasible to staff it with volunteers, but it would seem a prime candidate for a franchise operation as at Toddington. I shouldn't think local traders are worried that a cafe in the station would take their trade. Broadway station is a fair distance from the centre of Broadway village itself - far enough away not to cause any real competition. In any case, the station will bring more people in to Broadway, so overall there will be more customers for everybody. I doubt that the local council raised any objections, either. The station has gone through the planning process, and the council has been aware of, and approved, the GWR's proposals at every stage. If the council didn't want a cafe in the station, they could have simply said no when the plans were first put forward. I suspect the real issue is nothing more than a lack of imagination on the part of GWR management. I think the assumption has been made that a cafe at Broadway must be run in exactly the same way as the cafe at Winchcombe (which is volunteer-run). Since finding sufficient volunteers to run the railway is already a bit of an issue, I can understand that it might be felt that recruiting enough people to run a full-scale catering operation at Broadway would be difficult. It would mean a fair number people giving up a lot of free time, to do some hard work - for no money. So I think there's a genuine issue here. But I don't think the right answer is to simply say, "Oh, well, let's not do it, then" - especially when a simple solution is staring everybody in the face. It would be much more sensible to run the cafe at Broadway like the Flag & Whistle at Toddington (which is franchised out). But it seems that idea has not been considered. There are no nearby cafes. Indeed, the Caravan Club opposite has 120 stands but no cafe facilities at all. Their customers frequently come over to the station to look. Geoff, if local traders were putting pressure on the railway not to open a catering outlet this would have been done considerably earlier at the planning consultation stage. So unless the village of Broadway has its own catering Mafia, which has just made the GWSR board an offer it can't refuse, then I can't see this having a bearing. Far from resenting the coming of the railway, the businesses of Broadway welcome it. Please don't lose sight of all your brilliant achievements over a relatively minor matter. I'm sure that it will all pan out OK when the station is fully finished [probably a year or two after March 2018]. Thank you for your enjoyable blogs - they give a lot of satisfaction to a long term shareholder who has been very heartened by your progess since 1981. To add to the above, i think that some other perspectives need to be aired. Firstly, the railway is selling a visitor experience, not just a journey from A to B. You go to one of standard mainline franchises for that and go somewhere with more to see at the other end, after you've left the station. The difference with a heritage railway, as is so well exploited at railways such as SVR, is that it's a fully immersive experience. As soon as customers have to leave to complete their day out, like looking for somewhere to get a nice freshly made hot drink and a slice of cake, their experience bubble is burst. The visitor experience has to be at the heart of the railway's ethos, and especially with regard to keeping it a sustainable enterprise. This is the advice I provide to businesses day in day out in my profession, and I can advise from experience that almost all business in this sector which fail, also fail to take this on board and use it as their yard stick. If resources are stretched, and another cafe cannot be staffed, I would advocate closing a mid-line cafe currently open, to make it possible to open this one at Broadway. Reason being that customers will be far more likely to want to use a cafe at either end of the line. The timetable isn't extensive, except perhaps on special event days, and therefore it's impractical to get off a train part way along the line for refreshments, only to have a very long wait to continue the journey to the end of the line, or worse to realize that the timetable no longer works in your favour forcing you to curtail your journey at that station. The observation above about people having nothing to do till their return train leaves is a crucial consideration. Sitting in a warm cafe with nice cake and tea is a totally different experience to looking at a shop full of cheap plastic Thomas toys, or worse still a virtual jumble sale of old tat. It's certainly true that a big part of what a heritage railway offers is the experience of the trains and the stations themselves. It's also true that many people visit heritage railways for just that experience - they don't ever leave railway premises. But I think it's a generalisation to say that all heritage railways just sell the railway experience itself, rather than the places they serve. The Spa Valley Railway, for example, uses the slogan 'A destination at every Station'. The line actively sells itself as a way to reach points of interest along the line. I can see why they do that - with two other heritage railways in the same catchment area (the Mid Hants Railway and the Bluebell Railway), both of which offer broadly similar 'old railway' days out, the Spa Valley has to find a way of making their own offer different. The Swanage Railway is another line that markets itself heavily as a means of transport to an interesting destination, rather than a train ride for the sake of it. The Park & Ride service from Norden to Swanage has been bringing tourists in to Swanage for several years now - while keeping traffic congestion out of the town. It's marketed by the local council as the best way to travel in. Now that the Swanage Railway runs over Network Rail's main line into Wareham, it's become even more of a real railway. I took a trip to Swanage myself recently, and I would say that most of the people who got on the train at Wareham were doing so simply because they wanted to go to Swanage. There were even some people who had no idea they were travelling on a heritage line! On the other hand, there are some heritage railways that don't really serve picturesque tourist areas, and thus pretty much have to sell the railway experience itself. The Great Central Railway is a good example of this. It does not run through particularly dramatic scenery, and the towns and villages along the line are pleasant enough....but they're not Broadway, let's put it like that. So the line has worked to create a unique railway experience: double track, the Mountsorrel branch, etc. The big advantage of the Gloucestershire Warwickshire Railway is that we've got it all. A great railway experience, great scenery, and great destinations. I've read this and previous blogs with nothing but admiration for the efforts of the volunteers, but sadly I have to feed back to the railway management that they are not being treated with their due respect. These are people providing very high standard professional resource and skills to the railway FOC, and yet time and time again they seam to get the rug ripped out from under their motivation and morale. It must be remembered that these people were asked to volunteer to build a specific proposition, which was an authentic railway station including a cafe with a real fire etc, To change the plan at the last minute smacks of them being deliberately mislead to keep them bought in, and that there might always have been an under the table plan to reveal this once their support was less critically dependent. There is of course an easy answer to this, if the railway management don't reverse their decision, the volunteers could just down tools and tell them to enjoy finishing the station and hanging shelves! A number of quite viable alternative options have been expressed in a very short time in the above comments, for other ways to get a cafe up and running without dependency on the current railway staffing. To add to these, now the railway is so close to opening at Broadway, has anyone thought about advertising the need for station volunteers to the town. As i understand it there's a very large retired population in Broadway, and many of those people might welcome the opportunity to volunteer at a not for profit cafe a couple of days a week, just to get out and about socializing. Just because Broadway is wealthy, don't assume there's no loneliness among the elderly. In summary, stop beating down the people working hardest for the least reward, get the communications flow sorted out and under control as people shouldn't feel it necessary to resort to leaking via blogs to air these issues, get the focus onto providing a high quality visitor experience that will drive visitor numbers and sustainability for the railway, and be more creative in the thinking about how to solution problems like this. Best of luck to all the teams working so hard at Broadway. I hope this latest storm can be overcome without too much disruption, and that you can still feel 100% proud of the end result once all the work is done. I would like to use this facility to say a big "thank you" to Joe Rosen, for keeping us remote shareholders informed, and for his tireless work to make Broadway as authentic as possible. Thanks Joe ! And thank you for your encouragement. I would like to add that the Broadway gang is fully in support of the cafe they thought they were building. I have even ordered the REFRESHMENT room doorplates for it. Joking aside, the decision to replace the planned cafe with a vending machine is absurd. With all the new houses being built in Broadway and the surrounding villages, the scope for recruitment of new volunteers must be high or else go down the franchise route. Leaving the cafe issue, the work carried out at Broadway and on the extension by all the volunteers is first rate and to be applauded. Thanks for the blogs keeping us up to date with the great progress. I look forward to the reasoning of the board. It may well be that this is simply a temporary measure; the line opens in only a few months after all. For all we know there could have been a range of last minute practical or legal issues affecting the cafe plan. Before people grab their pitchforks and blazing torches, perhaps someone locally could ask the board. I certainly shall. Mike Rose - The shareholder who asked for support to REVERSE THIS DECISION. I have been overwhelmed with responses. Volunteers, blog writers, anyone to do with this project you are held in high regard throughout the world. I have written to all the directors via the company contact form, to Maxine to ensure that each one has received the message. I have contacted two directors through their email. I have put our request on the Boardroom blog. I will meet the board to argue the case. Having read through the previous opinions I must say I am dismayed. So many instant experts. If only success was so simple. Why all this hot air about a café. If those responsible for catering on the railway feel that they cannot staff it, that in its self should be sufficient. The suggestion that one of our other cafes should be closed overlooks the fact that already members are declining to work at Broadway due to the extra travelling distance. As for offering it as a franchise, you must be joking. Some years ago I was involved with the letting of the Toddington franchise and we found it very difficult to find anyone to take it on. Having had a business in Broadway, I know only too well that it is not the honeypot that it once was. When the A44 Broadway bypass was opened, business in the village dropped sharply. Today some of the catering establishments only open during the main tourism season. Are we overlooking that with the exception of DMU services, we have excellent refreshments on our trains? Initially the signalbox will not be operational and so only one train can be at Broadway. Therefore each train will stand in the platform for at least 20 minutes whilst the engine runs round. Surely this is enough time for passengers to find the buffett car and they will be able to remain in the dry and warm. We must face the fact that the project has not gone quite as planned. The unexpected need for the extremely expensive stabilisation of embankment between Station Road bridge in Broadway and the Childswickham Road bridge has made a great hole in the available funds. At one time it looked as if there would be no facilities finished at Broadway due to the lack of money. I understand that the Trust has now agreed to assist and that we should at least have a booking office and toilets ready. I am sure that for the first few months we will be very busy especially with railway enthusiasts. However, in the longer term we may find that the demand is less that we hoped. The major problem will be the need for a car park. I understand that there is no money available for this though other options are still being explored. The lack of a car park will have a big effect on demand. Parking within Broadway is limited. The long stay car park is situated over a mile away on the southern edge of the village whilst the short stay car park in the village centre is quite small and expensive. A small car park does exist on the Childswickham road and is much used by coaches after they have dropped off their passengers nearer the village centre but it is hardly convenient for railway passengers. The Broadway team are doing a wonderful job. Please do not be distracted by these armchair experts. Thank you Tony for some sense. The Armchair Experts clearly have no concept of the constraint that the lack of car parking imposes. 15 minutes walk to the train at £4 for parking or free parking at Toddington or Cheltenham, adjacent to the stations. We will see what customers prefer. When the car park is built the cafe option can be sensibly assessed. Please do not use the pejorative 'armchair members'. The writer of this blog and many of its readers are active volunteers. Please also refrain from posting anonymously. In case it has escaped one's attention the SVR Bridgnorth station redevelopment places an enhanced catering facility at the heart of their project. That's a good part of £2.5M worth of enhancement. Clearly as this news is a surprise announcement to many the effort to seek new catering recruits in whatever form has been kept low key. Don't spoil what should be a tremendous achievement for the railway and it's volunteer team with poorly thought through offering at what will be the prime destination for many. I am definately looking forward to arriving at Broadway next year looking at these pictures. On the subject of the cafe, while I understand staffing may be an issue, I must agree with the side wanting a cafe instead of a shop. First reason: There are already a number of Souvenir shops on the line but to be honest what they sell isn't really of interest to people like me as it's mostly branded pencil sharpeners and T-shirts etc and aimed at kids and people who do not usually come to railways, and there are a number of shops in Broadway who sell far better merchandise than what the railway will offer. Second reason: I should tell you of my experience at the Great Central Railway yesturday. When I reached Loughborough, which is at the (current) end of the line, I could only get a cheese sandwich from a small bar I found in the station - they didn't have any hot food. Both of the cafes at GCR are at middle stations, Quorn & Woodhouse and Rothley. This means that at the point where you have the longest passenger "dwell time" (i.e during a train turnaround) you have the least to offer in food! It would be the same at GWSR as Toddington would no longer be effectively the terminus. It's already also a problem at CRC as well, as if you get the second or third rakes on your train you have to wait to get to Toddington or Winchcombe to get any hot food as these don't have kitchens. In my veiw, at the very least there should be something like toasted sandwiches/panninis (which strangely neither the trains or the F&W currently offer) and afternoon teas at Broadway. That would mean passengers who don't have time to walk to Broadway or stop via Toddington would be more likely to stay to eat there and find something they like. I would reccomend that if staffing was that much of a problem, a better solution would be perhaps a temporary relocation of the Flag and Whistle to Broadway. The F&W building at Toddington currently isn't as nice a building and is further "away from the action" as well, and I've personally not been that impressed with the range of food there in past visits. I've also often ended up eating a takeaway on the train due to time/timetable constraints, especially when using public transport to get to the railway. just catching up on the blog and amazed to see the views about the change of use of rooms .I believe that the café is vital to look after new visitors ,many of whom will start their journey at Broadway .The shop is not important , and I'm sure there will be many new volunteers offering to man the café ,including myself as we seek lighter duties ahead. But where will they park we all ask ? Am I right to say that the land below the station has been sold to the Council who will build a car park and charge visitors ? This should have been a key priority and if this is the best solution , lets hope it can be completed by next summer. First impressions of any attraction are so important and to have no GWR car park will cause us many problems as Broadway's facilities are already full up by mid morning . Not having the cafe is crazy! We completely endorse the other comments on this. Don't be silly, that's not going to help anything. If you want a footbridge and a full opening with everything ready, presumably you've got the money for that? It was either a soft opening or no opening if we were to open during March. The increased ticket sales can then pay for the footbridge quicker than if we hadn't opened at all. The cafe is a separate issue, and I agree it seems a poor decision. But it will not be solved just by sacking a dozen hard-working volunteers who've given up much of their spare time to do all the boring bits no one else wants to do, as well as having a normal working volunteer capacity. Well said. It needs a cafe long term, but lets see what transpires. Better that the 'cafe' be used for a waiting room than a jumble sale and kids toy shop. Hopefully cafe will come later. Unfortunately business politics occurs in every walk of life ( having been in retail for some 35yrs) we must have answers quickly and reasons as to why be what ever. Over the last 5-6yrs we have seen our catering side of the business grow about 5-8% every year and is a growing part of the business. It would be a shame if a cafe wasn't included as planned, as our visit to swanage railway this year it was nice to be able to get a tea, coffee and a piece of cake from the little hut on the platform at Norden whilst waiting. It would be a shame if there wasn't one at broadway as I'm sure it would be used by visitors to the railway, passengers on the railway and also walkers - considering the location being in the cotswolds. As someone pointed out earlier with the railway getting larger and consistently carrying more passengers and more operating days it will get to the point where there will have to be more people employed, this opens up a raft of other issues that will have to be address, would it be worth considering this issues earlier rather than later ? Seriously? I'm sorry to keep on going but I don't think you quite got my point about the board. They may well have come to what turns out to be the wrong decision (and I happen to agree with you and everyone else and think they have, but equally I don't fully know their reasoning yet) but they are definitely not fat cats. As I said, the board members are just extremely hard-working volunteers on the railway, who do all the boring bits, flying a laptop for 7 days a week in some cases, for free, in addition to the "normal" roles they have on the railway. The company secretary can be found covered in oil, grease and brakedust overhauling bogies, or walking several miles acting as shunter. At least 3 more are to be found on the train either as guard or in the buffet carriage. I could go on. My point is, yes, disagree with this decision by all means, I certainly do, but don't make out the board to be some evil money-grabbers sat in ivory towers - they're just not. As for the carpark and signalbox, you are clearly ignorant of the facts, either that or you are trying to use them as sticks to beat the board with regardless. I think most blog readers know the situation with at least the signalbox. It will all happen in time, but we're distinctly lacking in money at the moment as you must know, and we can't do it all at once. I highly doubt the first year of running to Broadway will be described in the future as "chaos", even before this it was well known we'd have no working signalling, carpark, P2 facilities, steps on footbridge or cafe in 2018. David, are you Donald Trump's enforcer? You certainly seem to have some of the attributes! Again a fantastic blog showing the amazing progress at Broadway. I agree it's a shame about the cafe but I see this as a temporary measure until the station is complete and another building is on platform 2. I'm sure that maximising the use of space available for gifts and refreshments within the present timescale and budget has been long thought over. Great job lads, looking forward to Easter 2018. Stroll on, are you for real? Who are you, Anonymous- a board member, perchance? In view of the many comments already made, could we please have a response from the board explaining the rationale if the building plans have changed? Currently, we only have a "leaked" report which should be confirmed or denied as appropriate. Please note that it is the shareholders who own the railway and it is they who have funded the fantastic work given freely by volunteers who have worked tirelessly to produce what we see today. It would be a great pity to see the morale of these hard working individuals drop due to any misinformed decision. I agree, at times of potential tension such as these the Board needs to lead from the front and get the message out. The current British Parliament is illustrative of what happens when strong leadership isn't exactly in plentiful supply. Well, that clears it up...a bit. Apparently the decision to have a shop, but no cafe, at Broadway was taken two years ago. That does beg a rather obvious question: why didn't anybody know about it, until the news leaked out just recently? "There is provision in the proposed new building for either a shop or a cafe; but not room for both. It was felt that a waiting room and shop with tea / coffee facilities might offer more, and be easier to manage. With the new EPOS system installed, a single till could cover all facilities. Decisions need to be made, to match the construction and fitting out." I assume a decision was made. But it seems nobody was told what the decision was. Well, at least the Board has belatedly got around to telling us what they decided, back in 2015. Maybe, if we wait until 2019, they'll tell us what they decided this year! I don't fully agree with the Board's opinion that a cafe at Broadway would discourage people from stopping off at Toddington and Winchcombe. Personally, I think there's more than enough trade to support an extra cafe at Broadway. The Flag & Whistle and the Coffee Pot cafe at Winchcombe are often very crowded already. Many times I've walked into the Flag & Whistle, discovered a massive queue and nowhere to sit - and walked straight out again. If passenger numbers rise after the line opens to Broadway (as we hope and plan they will) that problem will become more pressing. By the way, it's not just railway passengers who use the Flag & Whistle. It's become a popular stop-off point for cycling and motorcycle clubs - who just call in for refreshments but don't go on the trains. It's good that this extra business exists, of course, but it does add to the crowding. I don't know if the Board has considered the impact of non-railway customers, and whether this kind of trade would be a factor at Broadway. The Board also mentions on-train catering. In my view I don't think that's a real alternative. The range of refreshments is limited, and on busy trains it's difficult to get up to the buffet car and back, especially when trying to juggle cups of tea and bacon rolls on paper plates. Apparently on-train catering will be added to the DMU. Not a bad idea in itself, but, again, it's no substitute for proper catering facilities at the line's principal stations. Because there's limited space on the DMU (I assume the catering kit will be squeezed in to the guard's compartment) the refreshments on offer will also be limited. The Mid-Norfolk Railway offers refreshments on their DMUs, and while it's nice that it's there, they can't provide much more than tea and biscuits. But I think the one important point that comes out of all this isn't anything to do with catering at all. It's to do with communication. Not for the first time, the Board has shown that they're not very good at it. To organise the establishment of communication channels (electronic and paper based) for the dissemination/reception of information to members, volunteers, and the public." I think the phrase I'm looking for here is "Falling at the first hurdle". However, in one area of communications the GWSR is doing better than the GWRT. At least there is a list of directors readily available on the GWSR website. There is no such list on the GWRT website. So the GWSR board doesn't have a communications director at all, while the GWRT apparently *does* have a communications director, but will not communicate who it is. Well, all I can say is that if anyone is wondering why communication seems to be a bit of a problem on the Gloucestershire Warwickshire Railway, there's your answer! Phew, a storm in a tea cup! We have had the Board’s view. Here is a customer’s view. .The Rose family decided to take the grandchildren to a pretty Cotswold village called Broadway. “Hey kids! Let’s go for a ride on one of those old steam trains. Look!” They poured over a shiny new brochure. “ Boring, Boring, boring!” chorused the three children. “Boring, boring, boring!” chorused the kids again. It’s a two hour drive to Broadway, thought Grandpa Mike. Hope there is somewhere easy to park. We’ll grab a bite to eat with a cuppa and perhaps we can sit on the platform and wait for the train. I can explain to the grandchildren how the stations used to be when I was a train spotter at Oxford. I bet they’ll be gobsmacked when the steam engine arrives. I hope, thought Grandpa Mike….. There nothing like a friendly cuppa, thought Grandpa Mike. It's a good point about non-railway customers. I mentioned it myself, above. It seems the Board has based their decision on the predicted requirements, and behaviour, of train passengers only. I think their conclusion is flawed, but aside from that they don't seem to have thought about non-railway trade at all. There's no reference in the Board's statement to non-railway trade. It seems they haven't considered it. Personally, I *would* consider it. If I were the GWR Commercial Director I would research just how much non-railway trade comes through Toddington, and estimate how much might come through Broadway - particularly if a cafe at Broadway was advertised generally, not just within the railway. You also need to take into account the Caravan Club site, open and busy all year, we are regularly staying there and know alot of cafe businesses would come, especially if breakfasts were served, the Club marches on their fry ups! I've read all the comments and the statement from the GWSR Company Secretary.I've been intrigued as to what were the drawings submitted by the GWSR for the proposed Broadway Station Building layouts on Platform 1 to Wychavon DC Planning Department. Interestingly the documents NM1502039 & W1301373 show the end two room's as Waiting Room/Cafe and Kitchen. I cannot find anything on the Wychavon Planning Department seeking a variation to the planning permission granted for the change of use of the Waiting Room/Cafe and Kitchen to a Retail Unit and Store. I'm wondering if the GWSR is now in breach of the Planning Consent received for the Platform 1 Station Building, is this just an oversight for change of use that hasn't been submitted to the council or am I missing something. Interesting point. It's certainly likely that revised planning permission would be needed to change the use of the station building. If I had been drawing up the original application, I would have referred to the rooms as multi-use spaces, suitable for catering/retail/anything else. That would have created useful flexibility for the future, without having to worry about breaking the terms of the planning permission. I think the Council would probably say yes to change of use, because it's not a major change in the grand scheme of things. But it would require someone to do the paperwork, make the application, and pay the fee. Perhaps nobody wanted to do that. Was the reason the change was kept - how can I put this - 'discreet' for two years? John of Nuneaton. Exactly what I was thinking. Game set and Match. Thanks. Para 2: A decision made 2 years ago can be as wrong as it is today. Para 3: A traditional friendly café is part of a customer experience of a heritage railway. Retail therapy is not. Whether you force customers through shops before take off at an airport or sell goods at retail parks the customer’s wallets know what you are up to. Para 4: The coffee machine is seen as an insult to a traditional café and I suspect you realise this. Para 5: You have built a terminus and that needs terminus facilities, (Kidderminster), food and drink being one need. Para 6: You need to cater, literally, for passengers coming to Broadway from cars, buses and steam trains. Para 7: There are plenty of people who will man the café. Read my emails. By-pass this excellent Edwardian station? I do worry about the board’s concept of customers (passengers). Having read all of the comments made re café / retail I can see the arguments from both sides. The current discussion has come about because we needed to instruct the Electricians where to put cables etc.as part of the "second fix" before plastering commences. However, if it is decided in time that we want to change over from Retail to a Café we need to make provision now for the cabling to be put in to support such a facility. Also you cannot have a Café without water and drainage provision. At least install these now so that we do not have to pull the building apart at a later date. At this stage , just a shell, the provision for the above would be far less costly that trying to install later date. Totally agree David, make passive provision for ducting etc., in the hope of the cafe being provided at a later date. As you say, doing it now will be a lot less intrusive and costly than having to do it to an operational station. have read the Boardroom blogpost by Richard Johnson, Company Secretary with some amusement. Quote '" there has been no sudden change of plan as has been erroneously reported" was his rather sniffy comment. Obviously aggrieved that daylight has now been shone on this under the counter approach to dish the aspirations of Broadways hard working volunteers. SO, Mr Johnson when was this decision, taken in 2015 apparently, reported on YOUR blogpost? I see no mention of it. Was it communicated to shareholders that the building they were funding was undergoing a partial change of use? Was the Council informed.? Instead you have kept quiet while volunteers happily debated the name of the new Cafe they thought they were building. Will it be the Honey Pot was one suggestion. Yet you keep quiet. I am sorry it is too late in the day to say that a shop was planned all along, because, apart from a small circle of Directors. who knew? JOHN OF NUNEATON you have made a very interesting point. Please could you send me your email. I'm at pensarnroses@gmail.com and have gathered quite a lot of supporters to reverse this decision.. I tried to post a comment twice on the Extension Blog this afternoon but for some reason its not working for me. I just wanted to comment about the cafe. I personally agree that there should be a cafe as originally proposed and for all the reasons given on the blog. I too am wondering what the ins and outs of this decision is especially at this late stage. To my mind, if the cafe can not be provided now then the building should be future proofed to allow for one when needed. For the kitchen area it is considered that all the services such as; power outlets, water and drainage should be installed. Also wall tiling, ventilation ducts and a sink should be put in. This would allow for the room to be used for storage initially and then fitted out as a kitchen when required with stainless steel wheeled fittings etc. As for the sink, well even a shop that just sells coffee and small snacks over the counter would require a sink. For the dining area it is considered that the walls and ceilings should be fitted out as originally intended with a replica fireplace and lighting etc. I would assume that if they are going to sell coffee over the counter then they would have at least a couple of bistro tables in front of the fire (are they still going to have a fire?). The shelving for the brick a brack should be free standing to allow for the dining space to be increased as and when the demand requires. I find this decision as inexplicable as, it appears, somewhat underhand. A "decision taken two years ago," and yet not communicated to the people building the station, has the distinct whiff of deception to it. It appears to have been kept quiet precisely to avoid the the sort of furore which has now erupted, and, as someone mentioned above, to avoid the possibility of volunteers downing tools. If this is not the case, I'm sure the Board can say so and provided sound reasoning. A cafe; nearest competition half a mile away; Caravan Club across the road; a couple of hundred passengers arriving evry 40 minutes or so: what's not to love? If you can't staff it with volunteers, franchise it and take the rent. Well after the furore over the design of the station building you'd have thought they'd have learnt their lesson. It appears not though. Remember that saying "Those who cannot remember the past are condemned to repeat it" Having said that, as this decision was apparently taken two years ago there was probably nothing to remember! With the passage of time this decision now needs to be reviewed. Then again, there's another saying that needs to be remembered - "You've got to speculate to accumulate" so let's see some speculating over the possible benefit a cafe will provide to both the site and the railway in general. Out of the station, and... over the bridge !